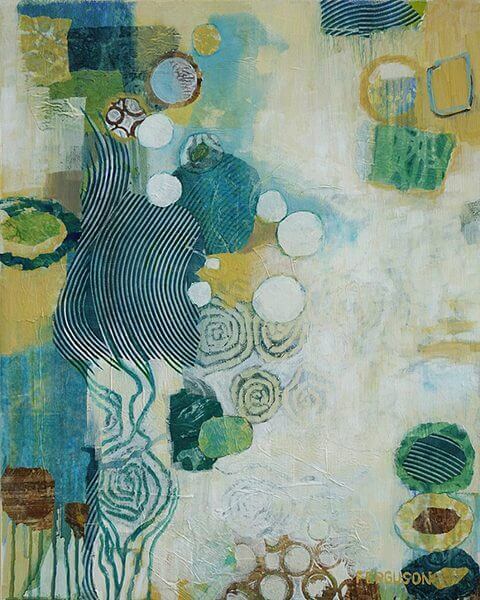 Kathy Ferguson is a mixed-media abstract painter living in Colorado and New York. On her website www.kathyfergusonart.com you’ll find several series of whimsical, colorful, and organic compositions of surreal and imaginary worlds that she describes as “[m]ore illusionary than authentic; places more commonly found in dreams than reality.” In her artist’s statement, she describes her paintings conceived in that magical interlude between sleep and awakening. 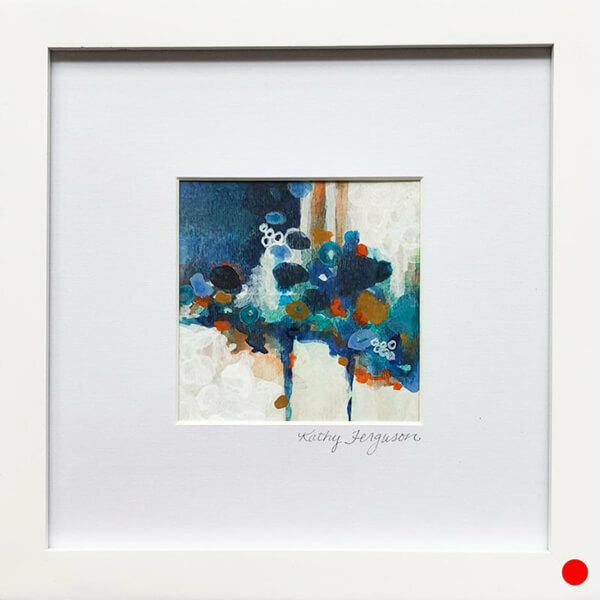 Technically, her paintings are multi-layered and frequently begin with a hand-printed paper base. Sequential layers are built up, scraped down, and repainted as she constructs her compositions. While most of the finished surface is covered, the underlying layers remain vital as she allows some of the earlier strata to show through. On occasion, she uses a blowtorch to create texture by bubbling up the paint. It’s interesting to recall the early Surrealist concept that a painting could be about a dream, as opposed to observing a real subject. This idea was influential in the early development of Abstract Expressionism. We do not know if that is a conscious influence in Ferguson’s work or simply a coincidence. 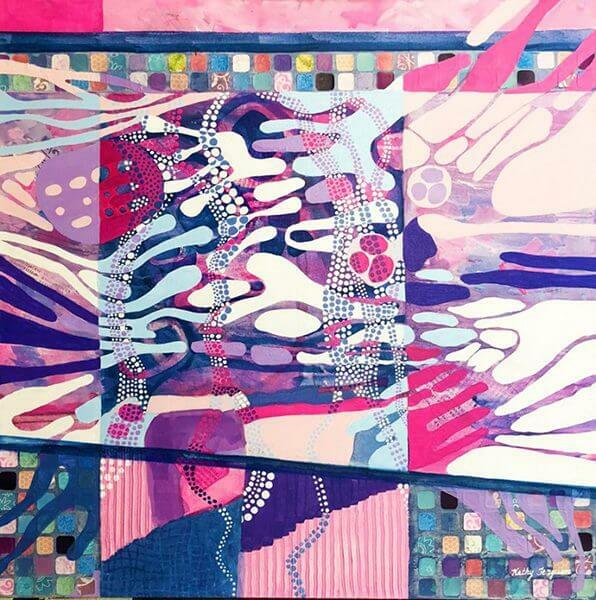 However, it is clearly present in her painting “Spiral Garden,” from her mixed-media portfolio, where her floating plant forms reside in a mysterious varied environment of land, water, and air. What I found confusing about this particular portfolio was that many of the paintings move away from this surreal, dreamlike quality and are presented as abstract compositions inspired by the reality of complex contemporary social issues that she describes in extensive detail. 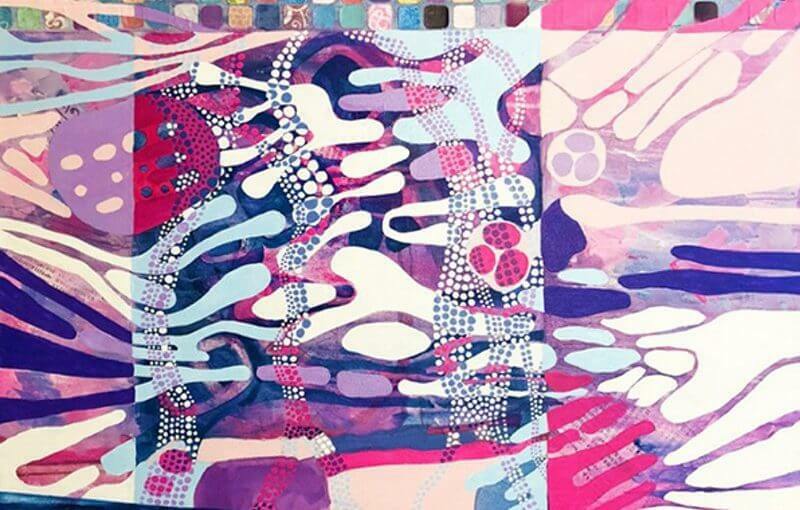 The description of “Women’s March” states: “This painting salutes all persons (the little dots) taking to the streets to march for social justice to draw attention to dismantling systems of oppression through nonviolent resistance and building inclusive structures guided by fairness, dignity, and respect.” Other paintings in this series go even further in describing what each individual color form symbolizes. If you share the conviction of the first generation Abstract Expressionists who believed the role of art is not to report on the visible but to reveal the unknown, her detailed descriptions provide too much information. Most abstract painters seek an emotional response to their work, which can differ at different times—it therefore is not necessary to understand a painting to experience emotion. An artist explaining exactly what a painting is about implies there is a right or a wrong way to view the painting. The Yoga series is comprised of six paintings inspired by her yoga practice and the desire to capture different facets of the ritual through Sanskrit titles. “KIRTAN” refers to a community gathering of chanting and meditation. This lovely lyrical painting expresses that peaceful and meditative state through its muted palette. Repeated elegant curvilinear forms allude to the rhythmic of chanting, and her layering technique sets the overall soft mood. These are the magical emotive qualities in painterly terms. Unfortunately, the description challenges the viewer to come back to a literal level. Her Little Gem series is simply delightful. These little paintings are produced with leftover scraps from the end of a painting session. Each one is a fresh and open example of where the imagination may lead when free to roam. These paintings are closer to how she defines her style and process—perhaps they are daydreams. I love her work. I think most viewers, like when at a museum, can differentiate between what they feel when they see a work, and what the side description says. The more interested you are in the artist, the more you want to know about what was behind each work. And isn’t that part of why you go to an artist’s website, to learn more? I do agree, simply delightful.